Of all the natural wonders in the world, the Great Blue Hole of Belize is a diver’s ultimate fantasy. 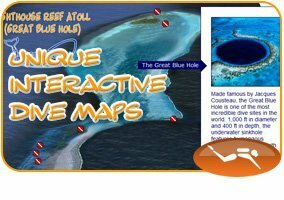 At the center of Lighthouse Reef Atoll (a coral island encircling lagoons), is an underwater sinkhole formed at least 15 thousand years ago when the land was above sea level. Then the ocean began to rise, flooding the caves. 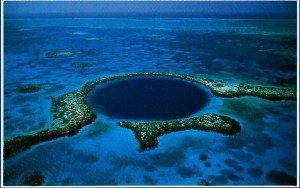 Now it’s a 400 ft a 400 ft. deep blue hole in Belize and a cavern of underwater mystery. Encircling its 1,000 ft radius is a vivid living reef, this amazing structure can even be seen from outer space! The Blue Hole Dive is to be enjoyed for its prehistoric nature and the grandeur of its enormous underwater stalactites. Adding to the trill of the dive are the resident Caribbean Reef Sharks which sashay from the deep blue. You will also explore the explosion of marine life along the walls of Half Moon Caye and Long Caye, as midnight parrot fish dart among the gentle swaying Gorgonians. 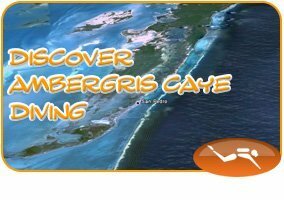 Ambergris Divers packs this trip to give you every perspective of the sites visited, from the deep caverns to the shallower ends rich with vibrant marine life. Plus a stopover at the island of Half Moon Caye for some island time and a quaint visit to the White faced Red Footed Booby Bird Sanctuary – a special encounter with these rate specie. Scheduled Regularly. 10-18 divers on board. Continental breakfast and Lunch. Water, sodas, and fruit refreshments. If you need pick up service from secluded properties within Ambergris Caye, a +fee applies. Full head on board and onshore rest room facilities available. $40usd park fee per person, which is due in cash upon check in. Dive Equipment: BCD, Regulator, Wetsuit, Mask/Fins: $22/set, please request & provide size. Schedule: **please check on schedule prior to booking online** Scheduled twice a week: inquire on availability. Departs at 6am, half hour check in required. *Charter Trips available - Inquire. Included: cont. breakfast, lunch, water, refreshments. 3 dives, tanks & weights. Price: Scheduled Trips: $309.00 usd per diver. $223.00 usd per snorkeler. $225.00 usd per snorkeler. +$40usd Park Fee; due in cash upon checkin. Dive Gear rentals are available, +$.